Three EWTN Series Airing in November-December! 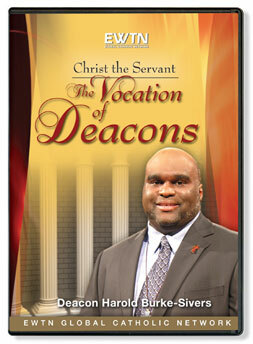 #1) My five-part EWTN mini-series, “Christ the Servant: The Vocation of Deacons” will be airing Monday through Friday, November 24-29,2013 in the United States and Canada. Check here for the times in your area. To the EWTN Family in SE ASIA and AUSTRALIA, CLICK HERE. Also go HERE to see my previous blog for those discerning the diaconate! #2) The series “Authentically Free at Last” (featuring me, Gloria Purvis and Damon Owens) will be airing Monday through Friday, November 25-December 9,2013 in the United States and Canada. Check here for the times in your area. For our friends in SE ASIA and AUSTRALIA, CLICK HERE. See my previous post that describes this series in detail. #3) Finally, my series “Behold The Man: Spirituality for Men” will be airing on Tuesdays and Fridays for the next few months in AFRICA and SOUTH ASIA. CLICK HERE for the schedule.